Visitors staying in Triopetra Villas” Fournou Lago will find the most amazing beaches at a distance of 2 km which is a 3 minute drive by car or 20 minutes walking distance. The largest greek island, is undoubtedly the island of Crete with its unique culture, history and tradition. This is the reason why the island of Crete is one of the top holidays destination that attracts annually a variety of visitors from all over the world. The island’s natural beauty along with its special atmosphere and vibe covers every taste. Visitors in Crete will have the chance to discover the island’s unique beauty and more remote beaches but also its vibrant nightlife in the center along but also a variety of cultural and historical sites. Triopetra Villas” Fournou Lago, is a private villas complex set in the stunning area of Triopetra in Rethymnon only a few minutes away from the sparkling blue waters of the Libyan Sea. Set at a stunning scenery, the complex is situated in the amazing Triopetra. Situated at a distance of 52 km south of Rethymnon and 8 km southeast of the picturesque village Akoumia, Triopetra is undoubtedly a coastal region of exceptional natural beauty. Built on a hill, Triopetra Villas Fournou Lago is a complex set in an astonishing natural surrounding as it is offering great views to the Libyan Sea making it a perfect fit for all desires. Each split-level villa has a unique decoration style and features a fireplace. Visitors staying in Triopetra Villas may find every hour of the day all the essentials at a distance of 2 km where the closest mini market is situated. Yoga enthusiasts are welcome in Triopetra as its endless beaches and idyllic scenery are the perfect match for yoga lovers. Set at an amazing natural scenery the luxurious “Triopetra Villas” Fournou Lago complex is a fully furnished complex in the stunning Triopetra in Rethymno, overlooking the Libyan Sea. Located at a distance of 52 km from Rethymno City and 13 km southeast of Akoumia village, it is a coastal area of uncomparable beauty on the shores of the Libyan Sea. Guests at “Triopetra Villas” Fournou Lago complex will enjoy during stay the astonishing scenery perfectly matched with all the modern amenities ensuring a memorable stay. Triopetra Villas” Fournou Lago villas complex features two villa of unique aesthetic, one named Stefania and the other one named Nikos, that are both the ideal choices for luxury holidays in the amazing island of Crete. Built at the quiet area of South Crete, in Triopetra at a top of 4 acres , they are found at a distance of 2km from the beach of Triopetra. Both villas have a unique decorative touch on the inside area and are very spacious with a size of 100 square meters each , accommodating up to 6 people. Each villa offers free private parking and private pool and playground. The complex offers its visitors all modern amenities conveniences consists of two floors with modern facilities and its location offers guests panoramic views of the astonishing natural scenery. 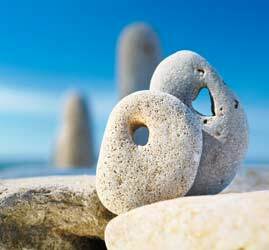 At a distance of 2km guests will find the magical beaches of Triopetra , the Large and the Small Triopetra. 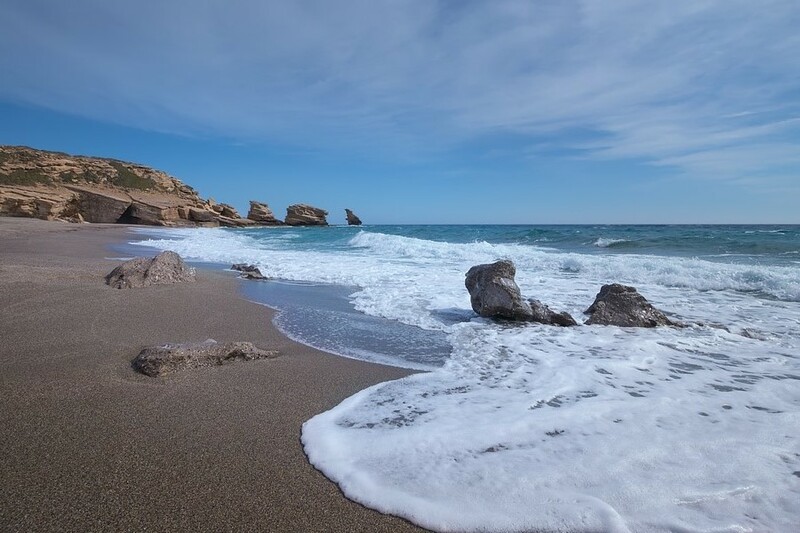 The beach of Triopetra- considered one of the best beaches in South Crete is named after the three huge rocks located at one end of the bay and is sandy with crystal clear waters. In other words there are two unique beaches, which are separated by rocks. Big Triopetra that stretches to the west and the Small Triopetra to the east are the two beaches that the visitors have to see during his stay in luxury villas Triopetra Villas Fournou Lago and enjoy the sea and the sun. Guests wishing to discover the surrounding area can explore the nearby market town of Spili, the Saturday market in Mires, the many shops and attractions of the city of Rethymno, as well as the caves of Matala. 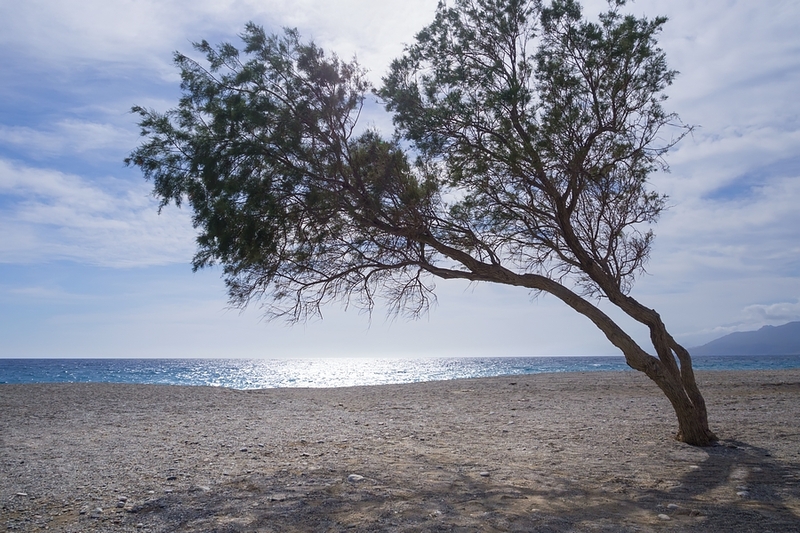 Visitors can continue exploring the part towards the east to the beaches of Agios Pavlos. At a distance of 30 minutes drive away visitors find on the south of Rethymno Plakias, a popular tourist attraction worth seeing during their stay in Triopetra area. 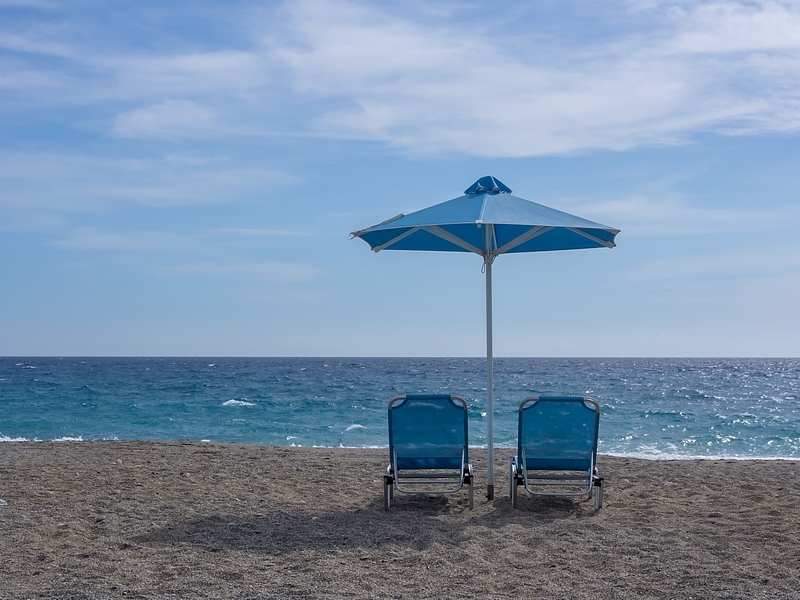 The main beach of Plakias is a sandy organised beach with sunbeds and umbrellas and amazing green waters making it an ideal choice for the whole family. Guests visiting the area of Plakias can also see the popular palm forest and Lake Preveli, which are undoubtedly the most famous attractions not only of the region but of the whole of Crete and are certainly worth a visit. The Preveli Monastery located 37km south of Rethymno is another attraction definitely worth a visit. In a beautiful location on the western slopes of the palm forest it consists of two separate monasteries, which are found at a distance of 1.7 km., Kato Moni of the Baptist and the Rear Monastery of Theologos.